BRISTOL - With three consecutive wins coming into Thursday, the Bristol Blues are playing some of their best baseball of the summer at the right time of the season with just three games remaining in the regular season. Bristol has picked up wins over the Worcester Bravehearts, Brockton Rox and Pittsfield Suns on the short win streak before hosting the Sunday Thursday. 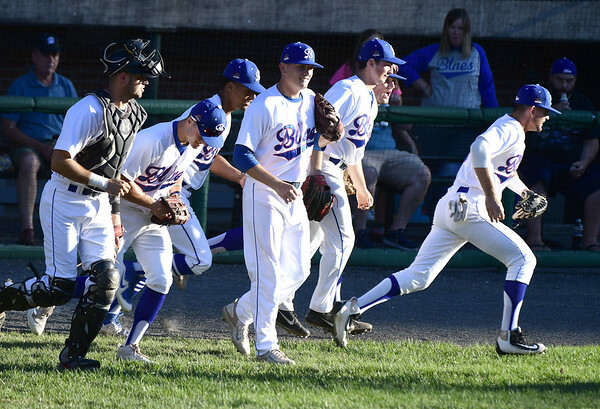 Most impressively, all three wins have come on a gruesome road trip that was supposed to be five games but was cut down to two with a pair of rainouts against the Nashua Silver Knights. Still, with the long bus rides Bristol is feeling it a bit. Justin Rouse, Zach Dionne, Neal McDermott, Michael Genaro, Michael DeLease, Richard Brereton and Emmett Sheehan all contributed on the mound for Bristol. Against Worcester, Dionne, Rouse and McDermott all were strong in relief of starter Adam Riggleman. The three combined for five scoreless innings with five strikeouts, three from Rouse and two from McDermott. Genaro and DeLease combined to allow just three earned runs in the win over Brockton. Genaro pitched the first five innings and DeLease went the rest of the way. Brereton continued the strong pitching in Tuesday’s win against Pittsfield with six shutout innings and seven strikeouts. Bristol’s lineup has strung together 29 hits in the three contests, with 13 against both Worcester and Brockton. But against Pittsfield the Blues left 10 runners on base, something Palmer hopes the team can sure up with the postseason nearing. “When we have opportunities with runners in scoring position we have to take advantage of them,” Palmer said. Just like the other teams in the Futures Collegiate Baseball League, the Blues are looking up at the Martha’s Vineyard Sharks, a team that has held the first place position for most of the season. With the team clicking and the playoffs right around the corner, the Blues are looking to bring the city its first FCBL title. If Bristol continues what it’s been doing, a run at the title could happen. Posted in The Bristol Press, Bristol Blues on Thursday, 2 August 2018 16:37. Updated: Thursday, 2 August 2018 16:39.